The absurd and fun-filled show runs through Sept. 2. Hackmatack Playhouse is closing out its 45th anniversary season with a production that’s a walk down memory lane. “The Fantasticks” was the third show of the playhouse’s opening season in 1972. After 44 years of requests, the musical returns to the barn stage with a quaint rendition that lives up to its tongue-in-cheek title. Marcus Provost sets the scene as the story’s puppet master narrator, El Gallo, lulling the audience with a beautifully rich performance of “Try to Remember.” From there, the satirical fable unfolds, introducing the audience to a girl (Mai Hartwich), a boy (Will Lombard), the girl’s father (Todd Fernald) and the boy’s father (Christopher Gempp). It’s an improbable tale, filled with proverbial meaning, as the boy and girl fall in love, secretly manipulated by their fathers, who have built a wall to feign a feud. Lombard offers an adorable and campy performance as the boy, Matt, head-over-heels for the girl, Luisa. His character is a lovesick puppy dog who views Luisa through rose-colored glasses, unable to see her flaws by the light of the silvery moon. Hartwich matches him, offering up a character who is capricious and whimsical. Her high soprano vocals ring crystal-clear on such songs as “Much More” and “Soon It’s Gonna Rain,” a duet with Lombard. The musical is filled with ironic humor, providing commentary on life and theatrical constructs. 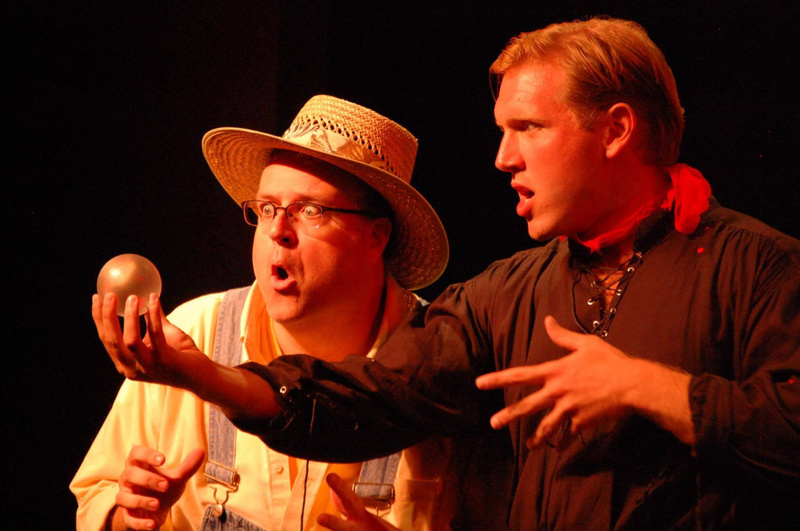 Fernald and Gempp delight as the fathers, Bellomy and Hucklebee. The expressive actors are a riot, parceling out truths on “Never Say No” and hamming it up on the metaphorical “Plant a Radish.” They also shine on “It Depends on What You Pay,” backing the ever-charming Provost as the scheming narrator. Gary Locke and Alec Paulson add over-the-top comic flair as Henry (The Old Actor) and Mortimer (The Man Who Dies). The pair keeps the laughter flowing, popping up throughout the play in sublimely farcical costumes by designer Emily Karel. Ben Hanley rounds out the cast as The Mute, as well as El Gallo’s co-conspirator, the prop guy and various scene staples like the aforementioned wall. Musical director Adam MacDougall and Laura Jordan lend orchestration on piano and percussion from the back wings of the stage, comically poking their heads out on cue to add to the play’s deliberate absurdity. 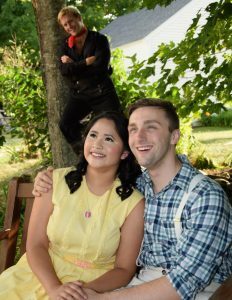 Hackmatack’s “The Fantasticks” revels in the ridiculous, heaping witticisms on top of life lessons. With an ironically beautiful score and fun-filled cast, it’s an entertaining way to close out the season.